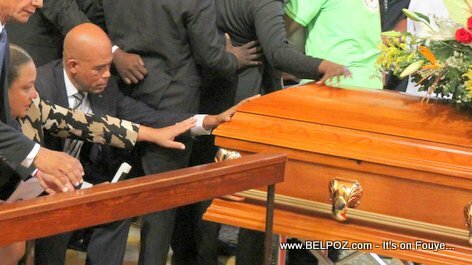 Haiti president Martelly and first lady Sophia Martelly reach out to touch the casket of rap kreyol singer Black Alex the day of his funeral in Port-au-Prince. Gade photo saa... Haiti - President Michel Martelly ak madanm li, Premiere Dame Sophia Martelly lonje men yo pou manyen cerceuil chantè BLACK ALEX jounen funeray li Vendredi 27 Novembre 2015 la... Kisa ou panse de sa?? ?